Our classes and on-the-job training bring you up to speed quickly on the specific skills you need to meet your career goals. 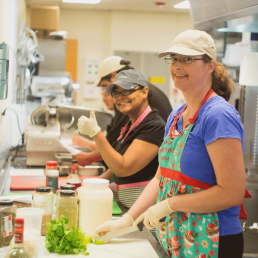 We start you with the basics – working in a commercial kitchen, basic kitchen operations, knife safety and equipment safety and basic safe food handling all taught by experienced and patient professional instructors trained to help you learn at your own pace. As part of your SFI training, you will have the opportunity to receive certification through the ServSafe® Food Handler and Food Safety Manager training program. The national recognized program is accredited through the National Restaurant Association. In addition to learning how to develop and operate a range of food service businesses, you’ll have a working knowledge of local food safety and permitting requirements as well as the skills necessary to develop a menu with cost analysis and profitability and viability as the focus. Find employment, start a food business or grow your existing business. Your SFI training is designed to provide the knowledge and confidence you need to hit the street running with introductions to successful entrepreneurs, networking opportunities, and other local resources to help support your business. 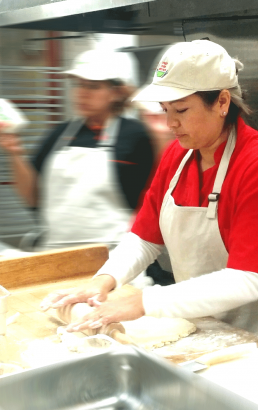 This lecture course focuses on the managerial aspects of food service entrepreneurship. Concept development, menu design, business models, licensing and permitting, the importance of food safety to businesses, marketing and branding, financing a food business, accounting for food business and other topics are discussed. Students work on the development and implementation of a variety of food businesses throughout this course. CNM Students: Please register through CNM website. Community Members (non-CNM students): please contact us. This lab course complements the lecture topics discussed in Course 1. Emphasis is placed on concept, menu and product development through recipe testing and thorough cost analysis of student designed menus and food products. Recipe tests are performed regularly to refine and develop the student’s food concepts. Upon course completion students may elect to participate in an internship program to gain hands-on experience in the café, catering and food truck venues. 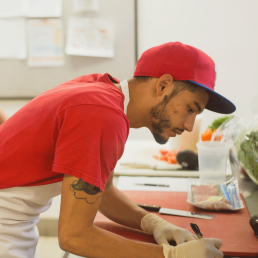 Upon completion of Courses 1 and 2, you’ll advance your safety and sanitation skills through the industry recognized ServSafe® Food Safety Program administered by the National Restaurant Association. In this online course you’ll become familiar with the U.S. Food and Drug Administration’s Health Code guidelines. 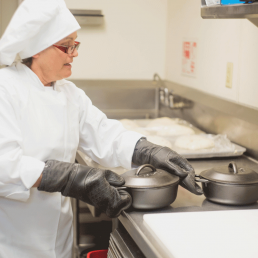 Here you’ll learn how to identify and control biological, chemical and physical hazards of food service- essential skills you’ll need to protect your customers and your business from the dangers of potential food-borne illness. All students enrolled in the SFI Entrepreneurial Food Management will be required to pass the ServSafe® Food Handler Online Course. Our goal is to make sure you are supported throughout your venture. 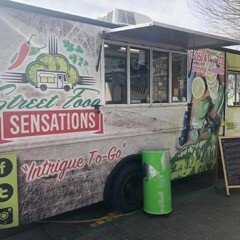 Your program includes ongoing business support and consultation, business licensing, registration and permitting support, and vending and sales opportunity through the SFI café, local farmers markets, and other vending sites. Classes are offered in spring, summer and fall on a rolling schedule. The fee for the entire program for Community Members (non-CNM students) including classroom instruction, hands-on experience and ongoing support is $150.00. CNM Students: Please visit the CNM website to register: times and fees vary.